This Christmas we want to focus on having a wonderful time while not having to pay too much money. Just as when we talked about planning a cheaper Christmas vacation, we will not refer to homemade Christmas ornaments. Most people today just buy the Christmas ornaments from stores. This is not a bad idea but in the event that you can spare some time to create them yourself, why not take that cash that you save and buy Christmas presents for you? Below you will find some ideas that you can consider. 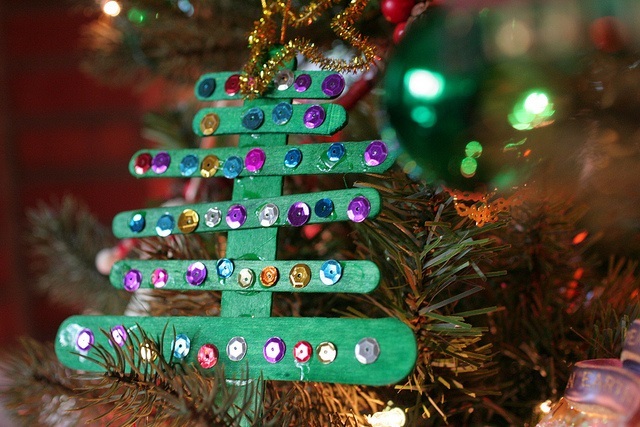 Every single one is a homemade Christmas ornament that is cheap and that you will love. Analyze the backyard. See if you have some acorns around. Use glue and caps to basically create a round shaped ball ornament. You can take a ball that is made out of Styrofoam and directly add in the caps with the use of hot glue. Put small layers of glue to what you added to the ball and add color glitter. Top everything off with a ribbon and with twine so that you can hang the homemade Christmas ornament from wherever you want. Most citrus fruits are great for ornaments because of the fact that they leave a natural scent that is very pleasant. You can simply take an orange or a lemon and then embellish it so that it is prepared for the Christmas tree. Use upholstery tacks in intricate patterns. Combine everything with a ribbon (preferably leopard-print). Your traditional Christmas tree will look different. Use your imagination to personalize the citrus fruits however you see fit. If you have some festive cookie cutters that have holiday theme shapes, you can also use them as Christmas tree homemade ornaments. You will need metal cutters and you have to use hot glue in order to add scrapbook paper with different designs. Make sure that you use the same themed paper for all the ornaments that you hang in your house. These are our favorites. Do you have some glass jars that you simply do not use in your home? There is a pretty good possibility that you do. Take one and then hot-glue a small miniature Christmas tree to the lid. Add some fake snow and then screw the lid. The effect is simply stunning. Based on the fake snow that you use and the actual tree, you can obtain stunning homemade Christmas ornaments and the price tags in this case is quite low for the effect that is created. Water, Wine Bottles And Dry Branches? This is a particularly creative way to create some really interesting and dramatic homemade Christmas ornaments. You need one bottle of wine and some branches. Add water in the bottle and stick in a branch. Decorate that branch with any bold ornament that you want. You can add a smaller candle or a light source close and the reflections on the wall will be great. It is a perfect way to decorate for all holidays, not just for Christmas. Chakra Colors – What Should We Know About Them?